Last week, we spent a few days up in Wisconsin at my parents’ farm. 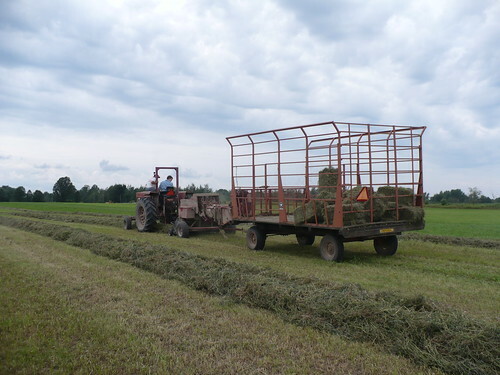 My husband, not having grown up on a farm, wanted to try his hand at a little tractor driving and hay baling. While my dad and husband were busy with the baler, I decided to wander around the edges of the field and take some pictures. This is a wild, unfarmed area to one side of the part that was being baled. It isn’t really the “edge” of the field, but more of an island that has never really been cleared or tilled, probably because there is either a low spot that isn’t worth the hassle of disturbing or because there was no desire to clear all off those trees. Maybe if I asked, my parents would know why. At any rate, it gave me something to photograph! You can see all the different kinds of grasses and lots of goldenrod in this area. This is actually a picture of part of the field that hasn’t been cut for hay yet. This field has a pretty nice stand of grass, clover, and alfalfa, and hopefully has some good protein for my parents’ cows. 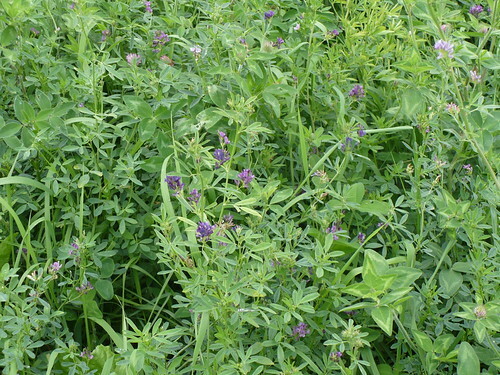 Unfortunately, even though the alfalfa and clover flowers make for pretty pictures, it is best if the hay is cut before full bloom. Unlike here, my parents have had too much rain, and so it was too wet to get into the fields without damaging the crop or the soil. I eventually wandered all the way along the field to the fence row on the west side of the field. There was quite a diversity of plants! I had to take this picture, because it illustrates a horticultural concept that we talk about, but isn’t always fully grasped. 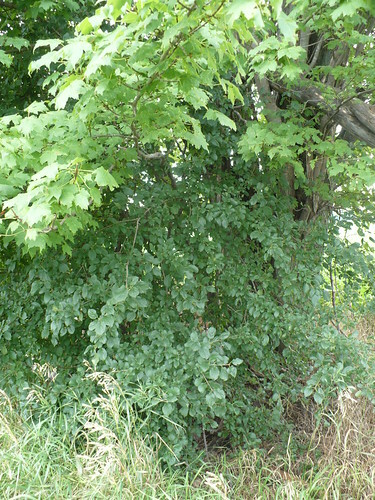 In this case, we have a larger maple tree (the lighter green leaves at the top) and underneath it, growing as a large shrub, is a dogwood tree. Dogwood do prefer some shade, and are more of an understory tree (like Japanese Maples). They don’t do very well planted in full, scorching sun. This is a great example of how these trees would grow on their own, without intervention, so we should keep that in mind when planting things. There were also some nice healthy vines of wild cucumbers growing over various trees and shrubs in the fence row. I remember playing with these prickly fruits as a kid, and tearing them open to look for seeds and whatever there was to see. I actually saw a cucumber beetle on these vines, but didn’t quite manage to get it in the picture. Interestingly, I’ve never seen a cucumber beetle in my parents’ garden, so it was interesting to see that they do actually exist that far north. 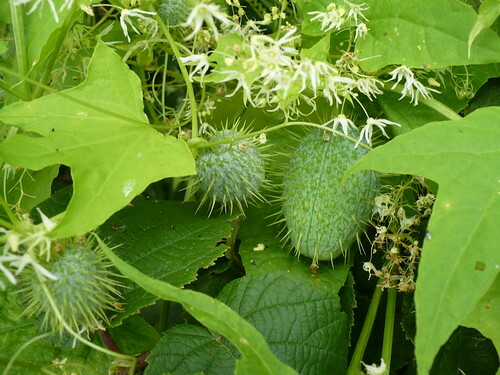 Maybe the cold winters keep the population low enough that they are content to subsist on wild cucumbers? I was a little surprised to find milkweed in the fence row, although I don’t know why I should have been. I guess I always associated it with the swampy area on the farm more than the edge of the fields (although sometimes they are one and the same!). These pods are not quite ready to burst yet, and they were about the biggest I saw. There were several plants with smaller pods and even a few plants that still had some flowers on them. I was hoping to find some monarch caterpillars, but no such luck. I did find some kind of tussock caterpillar and a spider, but not monarchs. There was also a kind of ugly, short little tree that had these fun shaped clusters on them. I’m pretty sure that I’m correct in identifying it as a filbert (aka Hazelnut); this is probably just a wild one growing here. It’s still very green, and not at all close to being ripe, but I think there are going to be some happy animals later this fall, thanks to this tree. Now, I’ve just been showing pictures here, and certainly photography is a great way to interact with nature and make observations. But…I’m also a compulsive feeler, “dissector”, leaf shredder, and flower stripper. 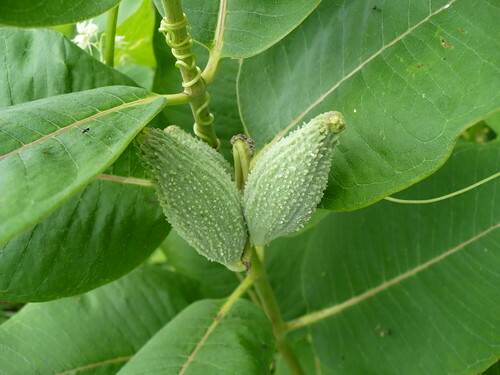 I like to pick a clover flower and pull it apart, pull off a milkweed pod and break it open, tear leaves along the veins, strip seeds off of grass, pick a green filbert and tear it open, etc. I’ve always done this, and I remember a lot of “play” as a child that involved pulling seed pods off of weeds and tearing them open or pulling the seed heads off of grasses. On one hand, this seems kind of destructive. I would argue though, that this sort of thing is important for kids in getting to understand the natural world. It’s one thing to see something or take a picture of it and learn about it. It’s completely different to feel it and take it apart, getting your fingers sticky in the process. I think there’s a lot of learning that happens through something that might seem very destructive. Certainly, kids should learn that you don’t want to disturb natural areas or be unnecessarily destructive without reason, but sometimes I think we go too far the other way, and don’t let kids really immerse themselves in what’s around them. It isn’t their job to save the planet. It IS their job to learn to look on the natural world with wonder and find “cool” things to touch and experience. Think about it this way. How much more will a child who has spent time experiencing plants this way understand when they get to a science class that talks about plant identification, pollination, seed formation, vascular systems, parts of the seed, etc? They may not have known all the scientific terms when they were out playing, but they know what they saw, touched, smelled, and even tasted. They can now assign those terms to things they already know. I remember some of the biology and horticulture labs I had to do in high school and college, and I always thought that the lab exercises where we dissected flowers, seeds, etc were incredibly lame! After all, I had torn apart many a flower and already knew what I would find. It never occurred to me that some of the other students may have never seen those things in real life. Where am I going with this? Well, I would argue that sometimes we get a little too up tight about having everything perfectly manicured and tamed (How dare there be weeds in the ditches!) or too protective of every blade of grass (Don’t pick the flowers!) that we prevent kids, especially those in an urban environment, from really gaining a very tactile experience of nature that will give them great benefits in the future. Of course, I’m not advocating for taking hordes of kids out to trample a wetland or tear into endangered wildflowers. But is there really anything wrong with letting some places be a little overgrown where no one cares if kids act like kids in that space? Okay, that’s the end of my rant for today! If you want to see more pictures from Wisconsin, you can check them out at Flickr. Posted on August 24, 2011, in Around the Garden and tagged farm, hay, kids, nature, trees, wildflowers. Bookmark the permalink. 2 Comments. Awesome post! I’d guess that your folks’ farm has more than one species of milkweed. (I’ve found 8 or 9 here on our little 10 acres.) The one in the wet area is probably swamp milkweed; the one in the hedgerow could be common or Sullivan’s or ???. 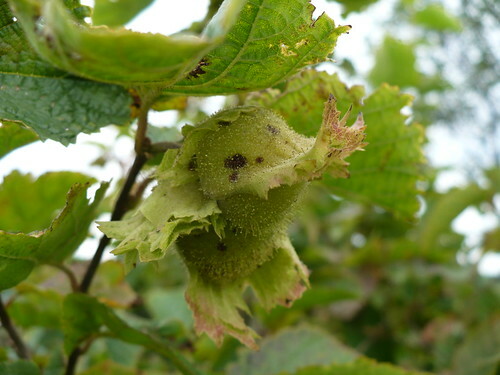 Neat to see the filbert (hazelnut) growing wild. They are supposed to be native here, too, but I’ve never seen them in an uncultivated area. 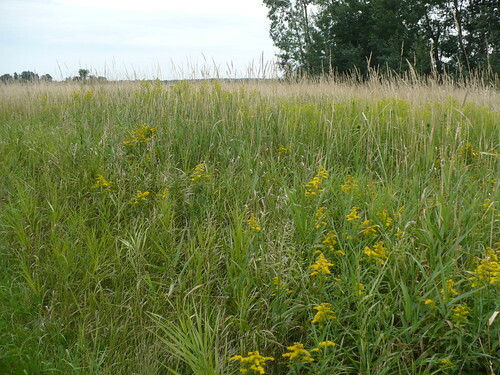 Probably a native prairie remnant in your second photo (with the goldenrod). It would be interesting to see what species are there overall. Most of all, I love your thoughts about kids having the freedom to explore – on their own, at their own pace – the natural world. It seems like the rare child that gets to do that these days. Amen! I agree to freedom to explore! Thanks for sharing!